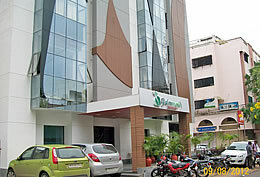 Located in the heart of the city (Alkapuri). Prime business and shopping location. 8 km from airport, 1 km from Railway Station, and 4 km from Central Bus Stand. 24 spacious rooms with all facilities: All rooms with multi-channel LCD TV; 24-hour Room Service & Housekeeping; Travel Desk; Doctor on Call; 24-Hour Wi-Fi Facility; Same Day Laundry & Dry Cleaning Service; Running Hot & Cold Water. Multi-cuisine Restaurant. To Book Your Room, Just Click Here.